This organ has the distinction of being the very last Theatre Pipe Organ built by the John Compton Organ Company and installed in a UK cinema. The organ, job number A516 was originally installed at the Plaza Cinema, Crosby, near Liverpool, where it opened on 2nd September 1939 with George Dawson at the console. When war was declared the following day, the cinema closed (as were all places of entertainment at the start of WW2) and a world record was thus established: the cinema having opened and closed in one day! Reginald Dixon and Stanley Tudor played the organ at Crosby and the organ remained in the cinema until 1974 when it was removed to a private residence in Chester. The organ was purchased and removed again to Belper in 1988. The building housing the organ was originally built in 1948 as a pigsty and was later used for rearing calves. Thankfully all traces of this earlier use have now been removed! After conversion of the building the organ was installed and the opening concert took place on 2nd September 1989, exactly 50 years after the organ was first presented to the public at Crosby. When new the organ had 2 manuals and 5 ranks of pipes, plus a Melotone unit. The organ has now been enlarged to 3 manuals and 10 ranks. The original 5 ranks are Tibia, Flute, Cello, Tuba and Muted Trumpet, to which have been added Diapason, Stopped Flute, Clarinet, Oboe Horn and Vox Humana. One unusual feature of this organ is that it has both genuine chimes/vibraphone as well as synthetic versions derived from the Melotone. Comptons normally excluded the genuine versions on their later organs, having just the synthetic ones instead. It is presumed that this was on the grounds of cost. However, this organ had both from new. 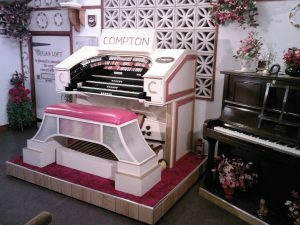 As this was the last Compton Theatre Pipe Organ to go into a UK cinema, Comptons may have been clearing out the factory and had some spare percussion instruments lying around! The organ was installed and is maintained by David Hill of Caistor. A 1926 Steck pianola has been added as a piano attachment and the original 1939 Melotone unit replaced with the 1964 unit that was part of the late Tony Lucas’ 5 manual Compton electronic organ at Tetbury, Gloucestershire. (Frank Cornish now has the console from this organ). An extra octave of Diapason pipes and a 16′ Tuba have also been added together with some additional couplers. A third (Solo) fully unified manual has been installed within the console.